I cannot say too much about the cover artwork of Sam Sykes’ debut novel, “Tome of the Undergates”, featured on both UK and US editions, because I am not a fan of it. 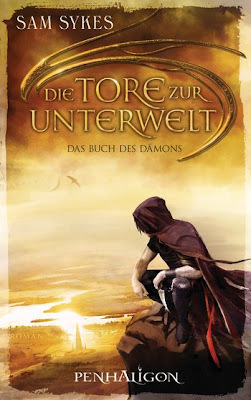 But looking over the German cover artwork for the same novel I cannot ask myself what went wrong. It is true that the cover of the German edition of Sam Sykes’ “Tome of the Undergates” (Die Tore zur Unterwelt), due to be released in April by Penhaligon an imprint of German Random House, features yet another hooded figure, but on the overall it looks far more better than the UK and US cover artwork. At least for me. The scene overlooked by the character is interesting enough and the color scheme is truly appealing. It is definitely the winner of the comparison. I believe that the German cover was made through the Hilden Design agency, by the artist Isabelle Hirtz. I think the cover art is quite stunning. Damn, this foreign art beats UK&US covers consistently!